Published: April 16, 2013 at 05:31 p.m. Updated: April 16, 2013 at 07:03 p.m.
Pat Summerall spent 10 years in the NFL as a player. He spent another 40 years describing the game he loved as one of the sport's iconic broadcasters. Summerall passed away Tuesday at the age of 82, Fox Sports spokesman Dan Bell confirmed to NFL.com and NFL Network. According to University of Texas Southwestern Medical Center spokesman Jeff Carlton, Summerall's wife -- Cheri Summerall -- said Pat died of sudden cardiac arrest. Summerall called a record 16 Super Bowls on television and 10 more on radio, showing incredible versatility. He transitioned from an analyst early in his career to a play-by-play man with his classic, understated style. Summerall called games on CBS from 1964 to 1993 and then moved to Fox with John Madden as the NFL's signature broadcasting team of the last 30 years. The last championship game Summerall called for Fox was on Feb. 3, 2002. Madden released a statement regarding the passing of his longtime friend and colleague. "Pat was my broadcasting partner for a long time, but more than that, he was my friend for all of these years," the statement read. "We never had one argument, and that was because of Pat. He was a great broadcaster and a great man. He always had a joke. Pat never complained, and we never had an unhappy moment. He was something very special. 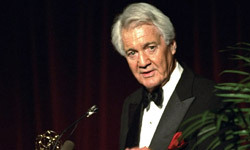 Pat Summerall is the voice of football and always will be." NFL Commissioner Roger Goodell also released a statement in which he called Summerall "one of the best friends and greatest contributors that the NFL has known." "It is a sad day in the NFL," Goodell said. "Our hearts go out to Pat's wife, Cheri, and the entire Summerall family. Pat will always be an important part of NFL history." Summerall primarily was a kicker during his 10-year NFL career, first with the Detroit Lions and the then-Chicago Cardinals before the New York Giants traded for him to play on some terrific teams from 1958 to 1961. Summerall hit one of the most memorable kicks in NFL history during the Giants' 1958 regular-season finale against the Cleveland Browns, nailing a game-winning 49-yard field goal through the driving snow to keep New York's season alive. Two weeks later, Summerall was the Giants' kicker in the 1958 NFL Championship, commonly referred to as "Greatest Game Ever Played." He's certainly in the discussion as one of the greatest broadcasters the game has ever seen, too.